With the prevalence of hard water across the country, there’s a pressing need to find the best water softener on the market for your living space. Hard water negatively affects your appliances, diminishing their performance, durability and can throw off the taste and feel of your home’s water. 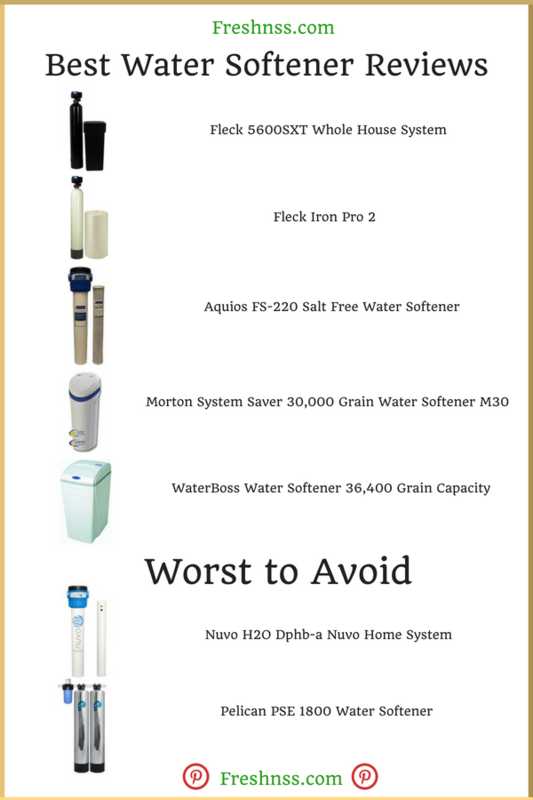 We’ve researched to bring you five top-rated water softener options on the market, plus two you should avoid. How does a water softener actually work? This is a hard to beat product and is probably the best water softener if you’re looking for a whole house system. The Fleck 5600SXT is a whole house system that’s effective and low-maintenance because of its impeccable design. It’s our top pick for several reasons. First, the electronic valve is the best available. Secondly, its reliability is founded on a 48,000-grain capacity in addition to the high-quality materials. This size and quality are hard to find anywhere else. Finally, besides needing salt added every couple of months, this unit requires virtually no maintenance. It’s extraordinarily self-sufficient. The resin tank is rinsed and replenished automatically with 4 modes available, so you can adjust it to your household’s specific needs. But, where Fleck really brings in the win is with their warranty. The valve comes with a 5-year warranty, while the tank has a 10-year warranty. These features make it the best water softener available. With a 64,000-grain capacity, this is probably the best water softener of its size. Not to mention that it uses the same digital control valve as the Fleck 6500SXT, regenerates automatically, and uses quality materials to ensure that it lasts for years. The Iron Pro 2 is specialized in one department though that makes it both: stand out from the rest and not suitable for every home. The Iron Pro 2 specializes in extracting iron from hard water. Unlike smaller models that attempt to remove iron, the Iron Pro 2 doesn’t clog or have a reaeration rate reduction. It’s shown significant removal rates as high as 8 parts per million. Or in other words, about 75 grains for each gallon of water. This unit comes with a 5-year warranty on the valve and a 10-year warranty on the tank. But, it also has a 30-day guarantee on your satisfaction as well. The first salt-free water softener listed here, it is not only one of the best water softeners but also a water filter. This combo conditions and filters while eliminating scale and maintaining your pressure. A pretty substantial system for its size and price. This Aquios system works a bit differently than the water softeners that use salt because instead of removing key minerals it affects their ability to bond. The best water softener for your home doesn’t have to remove all the minerals that cause hard water. A salt-free water softener like this one still prevents minerals such as magnesium or calcium to grab onto your pipes. This system is large enough to service your whole house and improve the taste of your water with a carbon filter. Aquios also includes a 20-year warranty, so if anything goes wrong, you’re covered. This unit is built to handle the needs of a large home. It’s built with a large tank and uses high-end electronics to adapt to your family’s water usage. The Morton MC30 can predict your water usage and identify trends after it acclimates to your home. The ability to predict and adapt as necessary can mean adding years to even the best water softener. Because it only regenerates when necessary, the unit is using only the perfect amount of water and salt. The Morton MC30 is an all-in-one, self-contained unit making it compact and easy to place in your home. It is also NSF certified and acknowledged for its efficiency without losing its effectiveness. The size and abilities make it a contender for the best water softener available. One of the cheapest options if you’re looking for the best water softener, the WaterBoss can serve a medium-sized household. However, while it is best suited for smaller homes when compared to others on this list, it also uses a filter for heavy metals. A 20-micron filter removes heavy metal contaminants to protect you, your pipes, and your appliances. Like other water softeners, it uses a meter system to regenerate. However, it doesn’t use fancy digital trend tracking; it determines the best time through water use. This unit can regenerate in about 38 minutes, so it uses less water during its regeneration time frame. On a low setting, the Waterboss will regenerate as a 36,400-grain capacity unit with about 3 pounds of salt and 14 gallons of water. The WaterBoss is quiet and an all-in-one unit so it doesn’t take a lot of space and can easily go unnoticed. From recognition as a glorified water filter to issues recovering a warranty claim, this Nuvo system is full of hiccups and bad customer feedback. There’s no silver lining feature that will save it either. This system requires constant maintenance, and if you plan on leaving your house for more than a day, it’s recommended you remove the cartridge immediately. Why? Well, because when the system sits unused for even a short period of time, it allegedly allows bacteria to cultivate quickly. Then the filter needs changing, usually before the recommended 6-month period. Many people opt for non-salt water softeners because of the low maintenance. This system doesn’t hold up to the needs of anyone looking for the best water softener. Another salt-free whole house system, but this one will cost you more than any of the salt water softener’s one this list without installation. It claims to be better than bottled water and requires no electricity. It uses a 4-stage filtration system, and that is all you need to know how it works. It is a wonderful filter, however a letdown when it comes to softening water. The biggest downfall of the Pelican PSE 1800 is the cost. This comes in at nearly double what the best water softener on this list did in terms of price. If you’re looking for the best water softener, you can find much better performance from other options and save yourself some cash while you’re at it. Buying your home’s water softener can be an arduous task, much like selecting a reverse osmosis system or whole house water filter. The devices seem complex and installation feels nearly impossible. But the cost of not addressing your home’s hard water will add additional cost to running your household, and may negatively impact your family’s health. Hard water means that your water supply carries a lot of extra minerals like calcium, magnesium and heavy metals such as iron. Finding the right water softener to combat this requires consideration of these key points, which affect the water softeners overall performance and lifespan. Salt-Based or Without Salt: Salt-Based water softeners basically exchange the unwanted calcium, magnesium, copper, iron and more for harmless ions. This is done in the tank, so the salt isn’t in the flow of your water. When the hard water passes over salt media inside the tank, it goes through an “ion exchange.” So, this way when the water is done passing through the salt it is softer. Your water doesn’t taste salty, and your appliances are protected. Salt-Free water softeners are actually “water conditioners” because they don’t technically soften water. Instead, they remove some particles like sodium and magnesium with a filter. Then they prevent lime scale and disruption to your pipes and appliances because the unit breaks the minerals ability to bond to metals. For many homes, this is enough and will protect your appliances. Water Hardness: Are you sure your water is hard? The tell-tale sign is that your detergents aren’t as effective. If you’re pulling out glasses or plates with water spots and streaks, then your detergents aren’t as effective as intended. Hard-water is probably the culprit. But, there is some grey area when it comes water hardness. If you’re looking for the best water softener for your home, start by checking your water’s hardness. There are several kits that are inexpensive. Because water softeners are expensive, you don’t want to go out, and by the biggest one out there is your water is only moderately hard. The scale on water hardness starts with “soft” and ends with “very hard.” Soft water is 0-1 grains per gallon and slightly hard is 1-3.5 grains per gallon. If you’re in this range, you could use a less intense water softener than a house that registers as “hard” in the 7.0-10.5 grains per gallon range. Water Flow Rate: Finding out your water flow rate isn’t an exactly a science. The water flow rate of your home is determined by how much water is regularly used. Most people make an estimate based on these factors: How many bathrooms are in the home?How many people are living in the home? How many water-based appliances are in use?Take into consideration appliances like your washer, and the dishwasher then counts them almost like another person in the household. Usually, bigger tanks have faster water flow rates, but the biggest on this list is the Iron Pro 2. It features the fastest water flow rate available at 16 gallons per minute. If you’re really not sure and considering a salt-free system, then you’re in luck. There are many salt-free models that don’t affect the water flow rate. However, many salt based systems can track and adapt to your water flow needs. Regeneration Process: Throughout our research, the “regeneration process” came up a few times. This sounds really technical but is fairly simple. This is how long it takes the water softener to completely recover from a period of hard use. Each model has a different regeneration rate. For some people, this isn’t a make or break aspect, but if you constantly use large amounts of water in your home, you could have difficulty with a long regeneration time frame. Many of the best water softeners can track and time their regeneration process. The best water softener should have the ability to track your water flow rate and time its regeneration process only when necessary. That way it uses the absolute minimum amount of water and salt necessary. It’s a simple question with a very technical answer. However, examining how a water softener works sets the salt-based and salt-free systems clearly apart. Understanding how they work can help you decide which is the best water softener for you. A salt-based water softener uses salt as a resin media. This means that as the water passes through the resin media, it undergoes an ion exchange. It removes the minerals and some of the heavy metals then, it replaces them with harmless ions. Basically, it takes out the stuff that hurts your appliances and replaces it with filler, which in the case of water is just water. When the unit is holding a large amount of calcium or magnesium, it begins its regeneration cycle. A salt-free water softener system works a little differently. Instead of removing the particles it removes the minerals ability to bond. Where calcium and magnesium are known to attach to pipes and inside appliances, it simply won’t be possible. After chemically altering the state of the unwanted minerals the water is technically conditioned, not softened. To find the best water softener start with an examination of your home’s needs. Living in a location with hard water, amidst a large household, running multiple water-based appliances, (as well as not even not using large volumes of water) can determine whether you need a water softener or not. At this point, you’ve probably recognized that it’s a wise preventive measure.